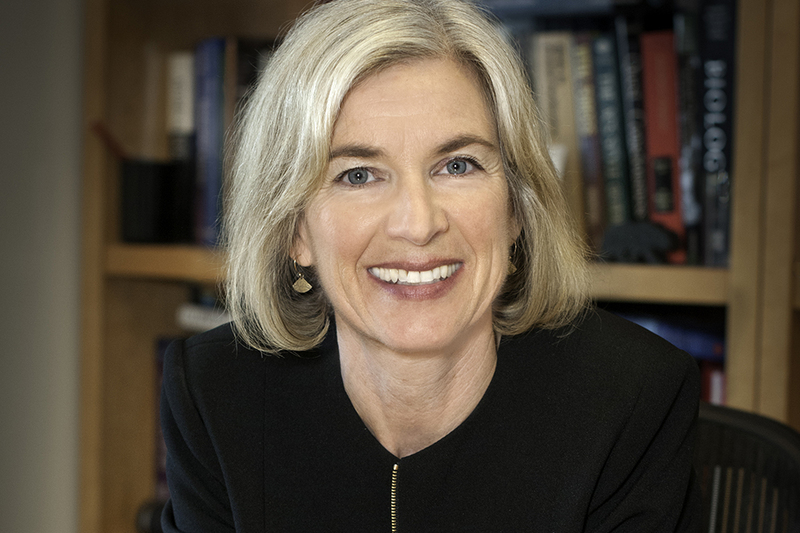 The Rockefeller University has announced that Jennifer Doudna will receive this year’s Pearl Meister Greengard Prize, a major international accolade honoring outstanding women scientists. Doudna is a professor of chemistry and molecular and cell biology at the University of California, Berkeley, where she also holds the Li Ka Shing Chancellor’s Chair in Biomedical and Health Sciences. She will be given the prize during a ceremony on the Rockefeller campus on Tuesday, October 2. Agnes Gund, president emerita of the Museum of Modern Art, a philanthropist, arts education and social justice advocate, and longtime supporter of women in the arts and sciences, will present Doudna with the award. A pioneer in the study of RNA, Doudna has devoted decades to illuminating many new facets of one of life’s essential molecules. Her research on the remarkably versatile structures and functions of this molecule has deepened scientists’ understanding of how certain RNAs act as ribozymes—enzyme-like molecules that catalyze chemical reactions—while others play a key role in the replication of hepatitis C and other viruses. In recent years, she has also become well known for her work on the gene-editing technology CRISPR. “Dr. Doudna’s career is filled with discoveries that have revealed unexpected and surprising features of RNA, and ushered in a revolutionary new era of possibilities in genomics,” said Paul Greengard, Vincent Astor Professor and head of the Laboratory of Molecular and Cellular Neuroscience at Rockefeller. This year marks the 15th anniversary of the Pearl Meister Greengard Prize, which he founded together with his wife, sculptor Ursula von Rydingsvard, and named after his mother who died giving birth to him. A lifelong advocate for women scientists, Greengard won the 2000 Nobel Prize in Physiology or Medicine for his contributions to understanding nerve cell communication in the brain. He donated his monetary share of the Nobel honorarium to The Rockefeller University to establish the prize, which then grew to become the preeminent international award for women in science it is today, comprising a $100,000 honorarium. Prize winners are chosen by a committee of 10 scientists, four of whom are recipients of the Nobel Prize. Doudna joins an esteemed roster of Pearl Meister Greengard Prize recipients, including neuropsychologist Brenda Milner; molecular biologist Joan Steitz, who was awarded the 2018 Lasker-Koshland Special Achievement Award in Medical Science earlier this week; geneticist Mary-Claire King, who identified the BRCA1 gene associated with inherited forms of breast cancer; and Helen Hobbs, who uncovered the link between mutations in the PCSK9 gene and cholesterol levels. In addition to her UC Berkley appointments, Doudna is a Howard Hughes Medical Institute Investigator, the executive director of the Innovative Genomics Institute, a joint University of California, Berkeley–University of California, San Francisco center, and a Gladstone Institutes Senior Investigator. She has received many previous honors including the Breakthrough Prize in Life Sciences, the Gruber Prize in Genetics, and the Kavli Prize in Nanoscience. Doudna is also a member of the National Academy of Sciences, the National Academy of Medicine, and the National Academy of Inventors. Visit this page to register for the Pearl Meister Greengard Prize ceremony and learn more about the award. The event is open to the public, but you do need to register to attend. The Pearl Meister Greengard Prize is an international award recognizing outstanding women in biomedical research.